Machine control-type features, such as Grade Control on this Caterpillar paver, have become more common on large asphalt pavers. 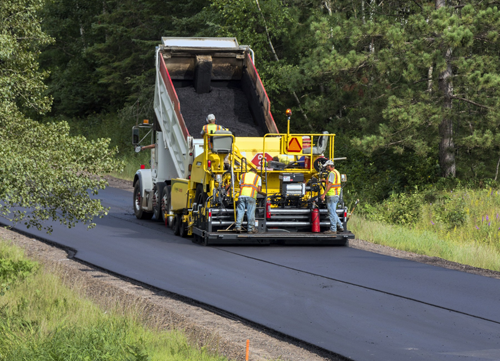 Large asphalt paver manufacturers have reason to smile as the market is good overall, and though there is some caution about possible headwinds, they continue to incorporate technology to increase contractor efficiency and control. “It’s been a really good year but the perception by some in the industry is that it hasn’t been, because 2017 was such a great year,” says Kyle Neisen, product managers for pavers and MTVs at Roadtec. “The industry is down some from 2017, but it’s still good progress. In 2017 we saw the fruits of the FAST Act Bill, and 2018 was the tail end of that.” Neisen adds that heavy rains over much of the country affected the ability to schedule some jobs. BOMAG says it is also seeing increased funding by states and municipalities. With recent stock market instability, a rise in interest rates, and stormy political waters, Construction Equipment asked OEMs if there were any headwinds on the horizon that might carry a whiff of recession. Volvo is bringing its ActiveCare Direct machine monitoring telematics service from its earthmoving equipment to its pavers, starting next quarter. “As an industry, instability in politics can affect bidding of future projects, and uncertainty about future infrastructure funding makes it difficult to plan and bid,” Neisen says. “It does look like we might be heading into slower economic activity than in recent times,” Laing says. “We do not anticipate headwinds specific to the asphalt paving market at this time,” Polk says. “Oil prices have remained relatively consistent, and over the years, many contractors have built up a good stockpile of recycled asphalt. The FAST Act’s expiration, and concern about its replacement, is causing at least some uncertainty, but Jim Holland, VP of Wirtgen’s Vögele brand, is optimistic. The skilled labor shortage also concerns manufacturers. BOMAG cites the retirement of long-time equipment operators as one of the reasons it is establishing two new training courses at its South Carolina Fayat Academy training center. “Experienced operators continue to retire at a high rate, leaving an experience gap for paver operators,” Polk says. “The need for quality training programs for less experienced replacements is nonstop and will continue to be of growing importance as companies lose more long-term employees to retirement.” The company’s classes will focus on operators as well as service and maintenance training. Before buying a new asphalt paver, managers should ask a number of questions. Anderson also advises that managers consider their crews. “Are they experienced, or a mix of old hands and novices? How easy are the controls to use? “Finally, consider the total cost of ownership: purchase price, operating costs, maintenance costs, and resale potential,” Anderson says. Managers should consider the types of jobs in their area and look for pavers versatile enough to handle them. BOMAG’s Polk also urges managers to look long term when purchasing a large paver. “With proper preventative maintenance and adhering to service schedules, these pavers are designed to give companies more than 10 years of reliable service,” he says. “Work with the manufacturer to get a clearer picture of total cost of ownership, so long-term operating costs are considered. “Also, the contractor should study the market potential for the area in which it operates. If there is a mix of large commercial and highway/Interstate work, then a contractor could benefit from a highway-class paver,” Polk says, pointing to the versatility of a 10-foot paver that can pave 28-foot widths at highway speeds yet still has enough maneuverability for tight parking lot applications. “When considering a paver, look at wear items such as the slat drive chains, slat bars, and conveyor floor liners to make sure they are designed to give years of reliable service life without replacement, and that they are backed by a strong warranty,” Polk says. Vögele’s Holland hones in on specific technologies. “[Buyers] should look for: a material feeder system design to ensure material consistency; precise-propel controllability, especially on track pavers, to allow the operator to maintain proper straight line that improves smoothness and joint quality; and a screed Hold-and-Freeze feature that automatically engages with the propel lever to prevent screed settling and hump due to stops and starts. This is a standard feature on Vögele pavers and an optional feature on other brands,” Holland says. In addition, Holland touts integrated, automatic grade-and-slope control systems like his company’s Niveltronic Plus system, and onboard diagnostic and backup controls that will allow operators to maximize uptime and efficiency. Telematics features and machine control options continue to see growth, enticing buyers to look more at technology. Technology leads to increased uptime, says Volvo’s Laing. “That all starts with the dealer—their local support and technical expertise can make a huge difference from one brand to another. Telematics systems are also a critical tool for uptime. Traditional telematics systems such as Volvo CareTrack can let contractors see where their machine is, fuel consumption, and get basic fault codes to help diagnose issues before they result in downtime. One major differentiator with Volvo is ActiveCare Direct, a 24/7/365 machine monitoring and reporting service managed directly by Volvo,” Laing says. ActiveCare Direct is currently available on earthmoving equipment, but Laing tells Construction Equipment it will be available on select pavers by the second quarter of 2019. “This service allows dealers to shorten the reaction time if there is a problem with the machine,” he says. Roadtec’s Neisen says his company’s Guardian Telematics is the only telematics system that allows live, two-way wireless communication. Expect even more automation as pavers progress. “Seemingly small mistakes by the operator can have an enormous impact on mat quality,” Laing says. “That’s why so many of the new features on pavers and compactors developed over the past decade are designed to assist the operators and help automate paver functions. Speed limiters, grade and slope control, auto vibration, and material-flow sensors on the screed are all perfect examples of technologies that help automate tasks that could cause mat quality problems, and really help to make paver functions easier for the operator.